The National Road Traffic Act, 1996 (Act No. 93 of 1996) and the National Road Traffic Regulations published in Government Notice No. 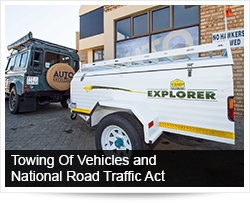 R.225 of 17 March 2000 stipulate the regulatory requirements for Towing of Vehicles. (b) drawing any other motor vehicle if the gross combination mass is exceeded. (b) in the case of any other vehicle by 240. (3) No person shall operate on a public road a vehicle which is a mini bus, bus, tractor or goods vehicle if the mass in kilograms of such vehicle or of a combination of vehicles of which such first mentioned vehicle forms a part, whether laden or unladen, exceeds five times the total axle massload of the driving axle or axles of such vehicle. other than a motor vehicle drawing another motor vehicle which is not a trailer, and a trailer, in the case of an emergency or a breakdown. a trailer or trailers attached to a drawing vehicle if the length of the drawbar of any trailer in such combination, where such trailer has more than one axle, exceeds two metres: Provided that in the case of an underslung coupling, the drawbar may exceed two metres if the distance between the two vehicles does not exceed two comma five metres. Note that a caravan in terms of the National Road Traffic Act is defined as an enclosed vehicle which is designed or adapted solely to live in and which is drawn by another vehicle. A trailer means a vehicle which is not self propelled and which is designed and adapted to be drawn by a motor vehicle. A caravan is also designed and adapted to be drawn by a motor vehicle thus it fits the description of a trailer and the law cited above does allow a drawing vehicle to pull two trailers. 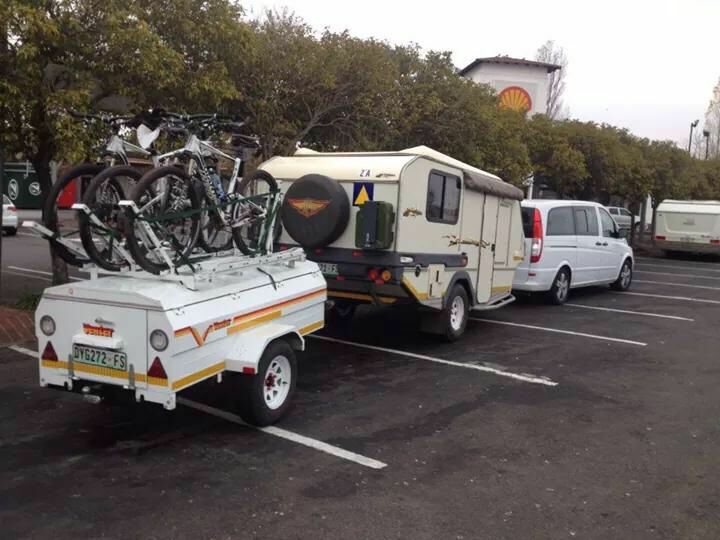 It is therefore legal to tow a caravan and a trailer.